AllAboutBuses invites you to banish the Monday morning back-to-work blues with a spot of time travel . . This week we jump back in time to 1986 in West London . 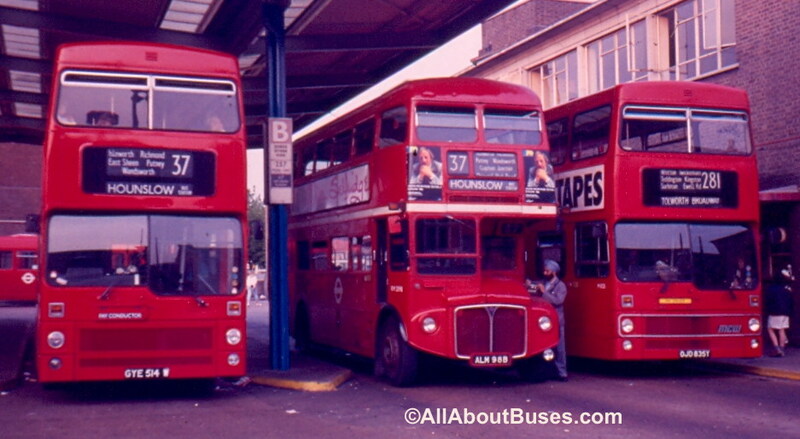 ..
It’s early June 1986, and lengthy orbital route 37 is in the middle of conversion from Routemaster to Metrobus, prior to OPO conversion on the 21st of the month. Both old and new order can be seen in this photo, with M514 on the 37 standing next to RM2098, and a further Metrobus on the 281 to the right of both of them (M835). Note the “Pay Conductor” flap on the 37 Metrobus (you can see it in the other, yellow “Pay Driver” position on the 281. The 37 was a very lengthy and useful service at that time, travelling from Hounslow all the way across inner south London to Peckham in the south east. As with many other services, it has since been cut back and split over the years, and the length of the old route was such that this journey is now only possible by using three buses – the 37 from Peckham to Putney, the 337 from Clapham Junction to Richmond, and the H37 from Richmond to Hounslow. This entry was posted in 1980s, London, Monday Morning Classic and tagged 1980s, London Transport, Monday Morning Classic, Routemaster. Bookmark the permalink.